Graph of the Week: Are Recessions Environmentally Beneficial? 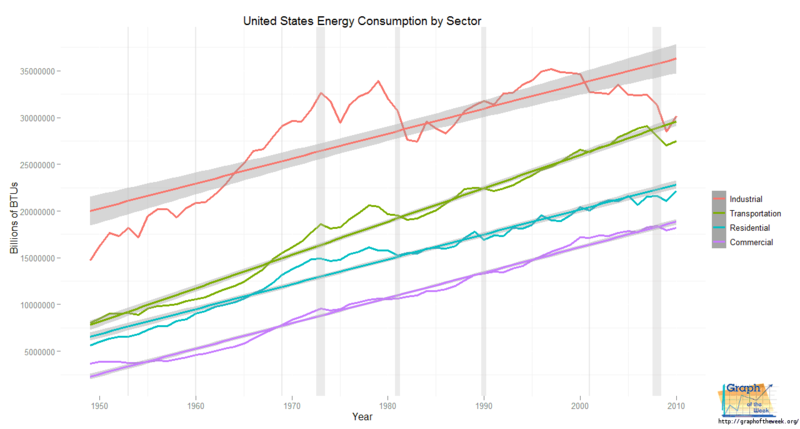 Total energy consumption in the United States by sector. Vertical gray lines represent periods of recession. In the above graph, each recession is marked by a gray vertical bar at the time it occurred. 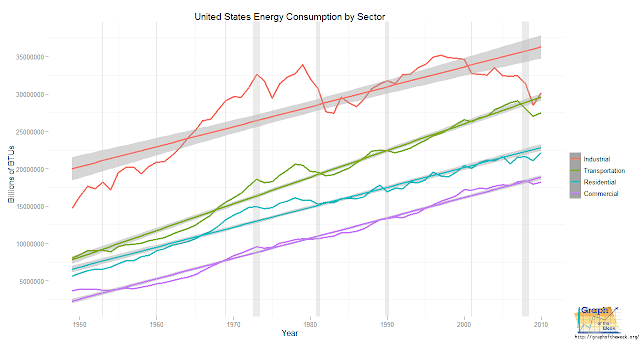 In almost all cases, energy consumption drops significantly. This would give an indication that periods of recession are actually beneficial to the environment due to less pollution. The Transportation sector is gaining faster than the rest. By the year 2085, it will surpass the Industrial sector to become the dominant sector in terms of energy consumption. 1. Can we reduce energy consumption while simultaneously existing in an economic boom? 2. How long can these upward trends continue? 3. Does energy consumption by the rest of the world match the same pattern as the U.S.? Labels: commercial, energy, energy consumption, Environment, green, industrial, Money, residential, sectors, transportation, U.S.